Israel “Ishi” Kunin’s forming a legal team with her daughter Shoshana Kunin-Leavitt at the Kunin Law Group happened more by accident than from planning. Ishi Kunin has served as a professional role model with published works in the Nevada Family Law Practice Manual and speaking engagements with the Nevada Supreme Court settlement program and the Nevada State Bar. Ishi Kunin knew her daughter, who practically grew up in her mother’s law office, could succeed as a lawyer. Nevertheless, Ishi Kunin ensured that her daughter chose her own career path and wasn’t pressured into law. Ishi Kunin practices several areas of family law, including probate estates, guardianships, trust administration to divorce, adoption and surrogacy. She has also served as a speaker on second parent adoption for the Human Rights Commission and an interviewed source for family law for KLAV-AM (1230). Shoshana Kunin-Leavitt agrees with her mother. Shoshana Kunin-Leavitt also has joined her mother as a fellow with the American Academy of Assisted Reproductive Technology Attorneys. On May 4, she will attend her first annual meeting of the organization in Denver. She attended the annual meeting with her mother in 1991. “We will see if the cycle repeats itself as I raise my two daughters in a law office,” Shoshana Kunin-Leavitt said. Kunin and Kunin-Leavitt are mothers to two daughters, another common bond. They have also been able to use the professional experience to learn from each other. Shoshana Kunin has proved her value to the Kunin Law Group by helping to implement new administrative and legal online tools. 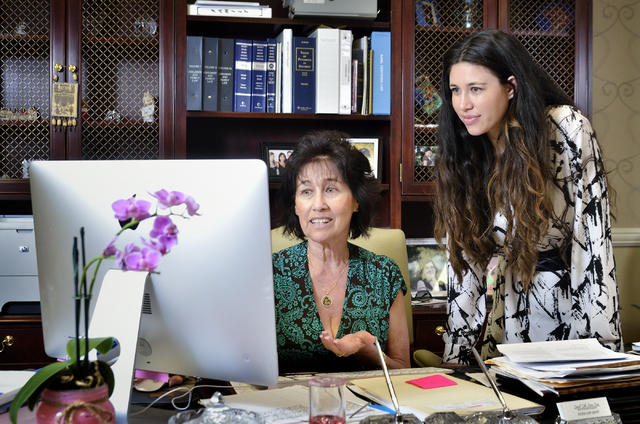 “She has brought us up to speed with technology because she has taken a real vested interest in how the business runs,” says Ishi Kunin, who is also a board-certified family law specialist. Adding Shoshana’s family and personal injury practices has helped Kunin Law Group grow steadily in the last five years. Regardless of the firm’s fortunes or current client list, both mother and daughter agree communication is the most important value to make any parent-child business relationship successful. Though they are colleagues and fellow lawyers, Kunin and Shoshana Kunin-Leavitt put family first. “I opened my practice with the idea that I would never have a partner, and I would not run my business any other way,” says Ishi Kunin.